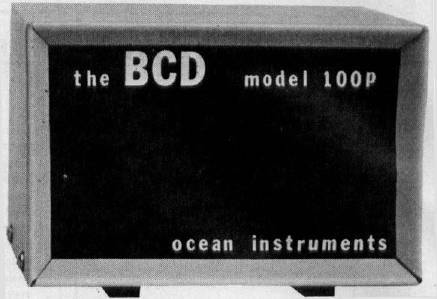 Ocean Instrumentation Consultants announces a low cost, general purpose, BCD interface module for Apple II and Commodore computers. Designed for the research laboratory requirement, this unit provides an instant interface to most O.E.M. lab instruments from digital voltmeters to mass spectrometers. In operation, up to eight digits of BCD plus status information, such as sign, "off scale," etc., may be directly entered as a BASIC variable. At present, applications include use with ORION 701A and CORNING 112 pH meters, HIAC particle counters, and MICROMASS mass spectrometer. The standard package comes with interface cable, user specified plug and diskette containing machine language subroutines and a demonstration program. The input is expandable to 16 digits and the unit may also be purchased with user specific software, tailored for special needs. $250.